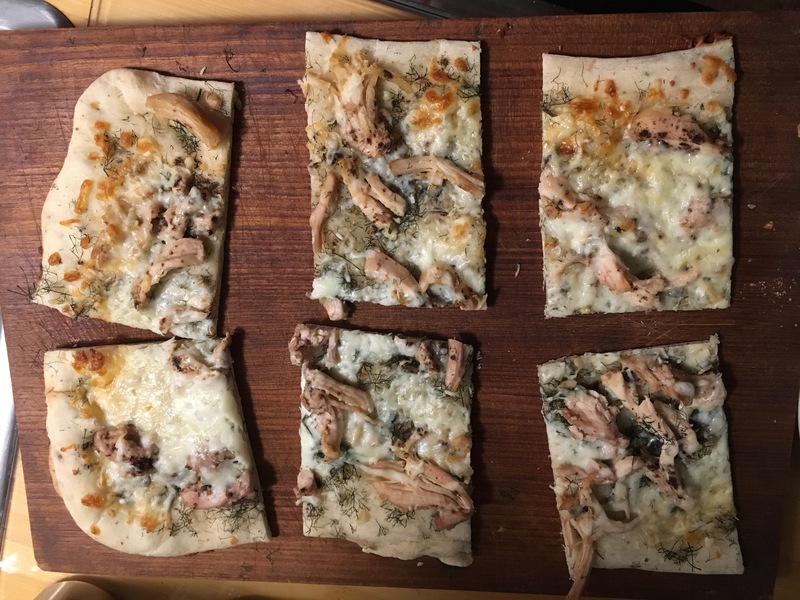 Nothing dire, its just that I recently discovered ready-to-use pizza dough at a local nearby grocery. Oh dear. Honestly, it is just too easy to make 3 days of lunches or dinners in practically no time using this stuff! I have been playing with toppings and today’s was (she said humbly) awfully good. 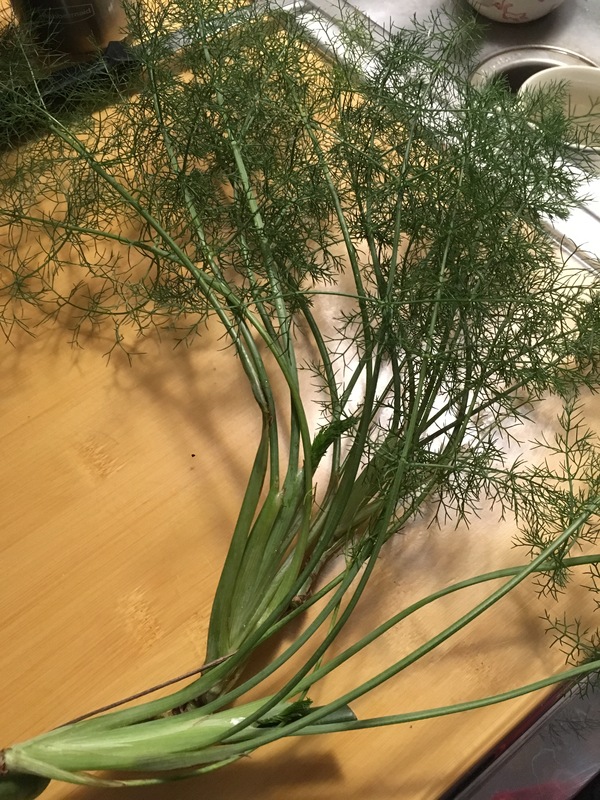 My yard is full of fennel. I grew it for the black swallowtail caterpillars, but there’s plenty for them so we share. I never dig the bulbs, and the stalks grow to 6 ft or better. They’re segmented sort of like bamboo, with lacy fronds that sprout at the junctures. I clipped a bit to add to my pizza. Now I like a thin crust pizza. Nothing against a breadier crust, it is just my preference. So, rather than the 12-inch circle recommended on the bag, I roll and push it into a rectangle and fill one of my larger baking sheets. Then I play. 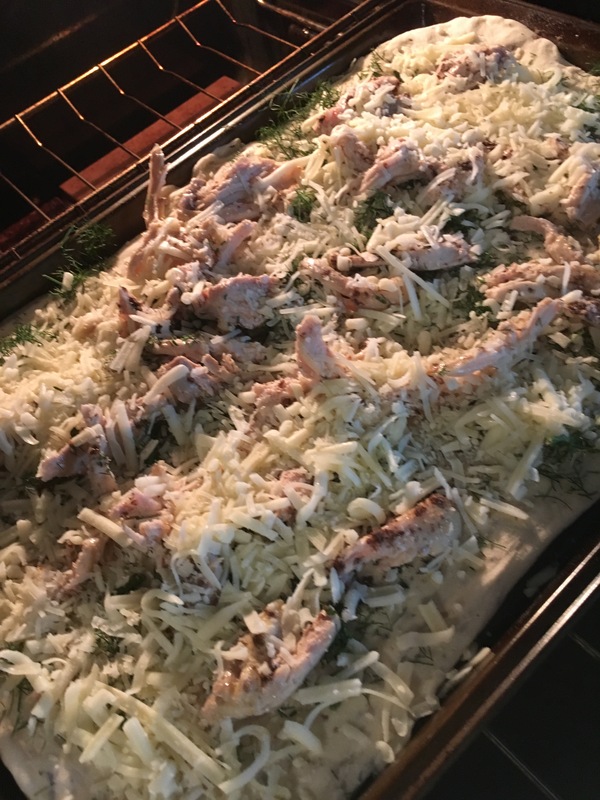 This time I chopped the fennel, then added roasted chicken, truffle zest, and 5 (yes, 5) kinds of cheese. 15 minutes later my kitchen smelled wonderful and lunch was on. Honestly, its almost too simple. So many options. It’s probably a good thing that the grocery that carries the dough isn’t too close to my house. I pass it a couple of times a month in my usual to-ing and fro-ing and that’s enough. What do you like on your pizza? Enjoy anticipating spring… and bon appetit! « chestnuts and mushrooms and chevre, oh my! and try broccolini with fresh tomatoes….